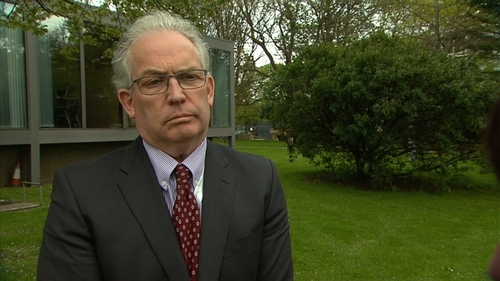 HSE Director General Tony O'Brien will leave his role at the beginning of July, four weeks earlier than expected. Speaking on RTÉ's The Week in Politics, Fine Gael TD and Minister of State for Mental Health Jim Daly said Mr O'Brien's new departure date from the HSE is due to him availing of remaining annual leave entitlements. Mr Daly said that a new HSE board will be in place in the new year. Mr O'Brien has been Director General since July 2013, having served as Director General Designate/Acting CEO from August 2012. In an update this evening, the HSE said that of the 10,731 calls to the HSE CervicalCheck helpline, 1,962 have been returned. Earlier this week at the Oireachtas Health Committee, when Fine Gael TD Kate O'Connell asked Mr O'Brien if he intended to stay on as HSE director general, he said he intended "to use the remainder" of his time with the organisation to focus on the cervical cancer issue. Fine Gael TD Fergus O'Dowd has called for Mr O'Brien to step down from his position. Speaking on RTE's This Week programme, Mr O'Dowd said his personal position as a backbencher is that "the buck stops" with Tony O'Brien and that he should resign. He said the office that Mr O'Brien holds must be accountable. Sinn Féin has described the move by Mr O’Brien as "absolutely outrageous". Speaking on the same programme, Sinn Féin health spokesperson Louise O'Reilly said: "I do find it absolutely outrageous that he is going early, so that he can avail of his annual leave - having come into the Committee to tell us he is going to dedicate himself to ensure justice is found for the victims of yet another HSE scandal." Fianna Fáil TD John McGuinness said he believes Tony O'Brien should step down with immediate effect and he should not have the choice in terms of setting his departure date.